Moving to a new apartment or downsizing your home? Here are 5 reasons Herculeze can do a better job than your typical movers! Moving into a new apartment or downsizing your home can be a stressful process, especially when there are plenty of appliances, furniture, and other items that need to be taken care of without getting damaged. 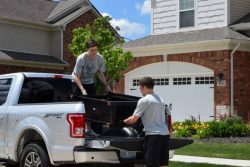 It can seem like a daunting task to complete, especially when you do not want to handle the items yourself, and are not sure of which moving company to trust. Delivery or moving requests can be scheduled whenever help is needed- No longer will you have to wait around for a moving company, which sometimes needs to be notified two or three weeks in advance. Herculeze jobs can be scheduled on the same day if the help is needed immediately. Help can be provided wherever and whenever it is needed! No minimums! Herculeze does not require a minimum time or price to take care of your delivery request! Drivers are willing to help, no matter how long or short the job may be! No more heavy lifting! When a job is booked on Herculeze, you are relieved of the hassle of having to lift and carry your heavy stuff- Drivers on the Herculeze platform are happy to take care of the hassle of carrying your heavy goods for you, and at a reasonable price! No more worrying about having to rent a truck! Herculeze is able to respond to your delivery requests quickly, and you will no longer have to worry about renting a truck from U-Haul, or inconveniencing a lucky friend by making them let you borrow their truck- Herculeze drivers are able to provide their truck and muscle, even on short notice! Herculeze provides more options! Posting a delivery or moving request on Herculeze means that you can choose the time you want it done, the amount of people you need to help, as well as other special requests such as extra bungees or blankets to take care of your items! You are also able to choose the driver and price that you like best! So don’t waste your valuable time or money searching for a reliable moving company. Herculeze can fulfill all of your delivery and transport requests by connecting you to a provider within minutes! It’s fast, easy, and affordable!